The bodybuilder-turned actor is another example of how fitness creates opportunity. Previous story Training Camp With DeMarcus Ware Next story Arnold Schwarzenegger Teaser Video! At 6’6” and 295 pounds, Ralf Moeller won the IFBB World Championships in 1986. Like Arnold Schwarzenegger, his physique paved the way for a career in acting. 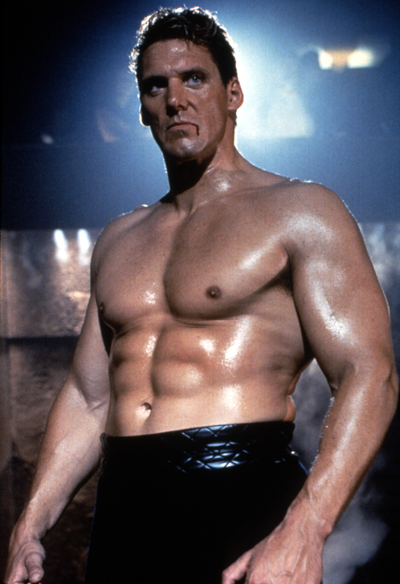 To date, Moeller has appeared in 40 movies and tv shows, including guy favorites like Universal Soldier and Gladiator. Here, the big German looks back on his career and friendship with the other accented big man he’s so often compared to. Muscle & Fitness: How challenging was it to win bodybuilding’s World Championships (in 1986) being so tall? Ralf Moeller: I always looked big from the front, but when I turned to the side there wasn’t enough weight to look huge from that angle. It all took time. Being 6’6”, I was definitely the tallest bodybuilder. Did Arnold Schwarzenegger give you any tips on how to pose? You made Cyborg in 1989. Did you decide to leave bodybuilding then? No. You don’t want to give something up that you’ve done for 12 years. In Europe, I was very successful in bodybuilding. In the ’80s, I had contracts and appearance fees. I made a fortune traveling around, guest posing and giving seminars. So I hung on a little bit more. Then Joe Weider actually helped me get my green card in 1992 and I moved over here. Then, the Conan TV series came in the late ’90s.Did Arnold give you his blessing to portray that character? Arnold didn’t want to go for another Conan. So I got the blessing and I went and did it. We did only one season. There were some complications but we had good numbers. It was a big success in Germany and some other countries. Then, some partner stepped out and it fell apart…A couple of months later, I got a call from Steven Spielberg. He was producing Gladiator and the casting director wanted me. Gladiator is the most memorable movie I was in. People love it. We received 12 nominations and five Oscars.